James "Jim" Bowie (pronounced BOO-ee; April 1796 – March 6, 1836) was a 19th-century American pioneer. He played a prominent role in the Texas Revolution. He died at the Battle of the Alamo. Stories of him as a fighter and frontiersman, both real and fictitious, have made him a legendary figure in Texas history. He is a folk hero of American history. The Bowie knife is named after Jim Bowie. Bowie was born in April 1796 in Logan County, Kentucky. He was the son of Reason and Elve Ap-Catesby (Jones) Bowie. Reason was a farmer and operated a Gristmill. The family moved in February 1800 to New Madrid, Missouri, then part of Spanish Louisiana. In 1801 they settled on farms in what is now Catahoula Parish, Louisiana. There Reason and his brothers swore allegiance to the Spanish government. Reason created a plantation there where he grew cotton and sugarcane. He also raised livestock and bought and sold slaves. This is where Jim and his brothers grew up. As a teenager Bowie floated lumber to market in the Avoyelles and Rapides parishes in Louisiana. He and his brother Rezin joined the army during the War of 1812. Their regiment was on its way to join Andrew Jackson at New Orleans when the war ended. After the war he and his brothers entered into the slave-trading business. During this time he developed a reputation as a deadly knife-fighter. He then got into land speculation. He bought large parcels of land and sold them whenever he could make a profit. Many of his land claims turned out to be fraudulent. He and his brothers moved to Arkansas where they soon were involved in new land speculation schemes. In 1830 Bowie moved to Coahuila y Tejas (now the Mexican state of Coahuila). There he swore allegiance to Mexico. He purchased land grants in Stephen F. Austin's colony. This, and the Cotton mill he bought, allowed him to become a Mexican citizen. He married Ursula de Veramendi in April 1831 and the couple settled at Saltillo, the capital of Coahuila y Tejas. In 1833 the capital changed to Monclova. When the two towns decided to fight over the issue, Bowie supported Monclova. Urusla and her parents died of choleria in Monclova in September of 1833. While living in Texas, Bowie had a number of adventures. One was written about by his brother John in an article: "Early Life in the Southwest—The Bowies" in De Bow's Review of the Southern and Western States (1852). While looking for a silver mine north of San Antonio Bowie, his brother Rezin and 9 others were attacked by some 150 Comanches. After killing a number of Comanches during several days of fighting, he and the remaining survivors escaped at night to a nearby settlement. Antonio López de Santa Anna was the president of Mexico during this time. He declared himself a dictator in May 1834. He then got rid of the congress and the state legislatures. Along with several other Mexican states, Coahuila y Tejas (Texas) rebelled. At first, the Texans (Tejanos) wanted the 1824 constitution brought back. But they soon changed to demand independence from Mexico. Bowie went to San Felipe, Texas to take muskets from a Mexican armory. He fought at the Battle of Concepción in October 1835 having been made a colonel of volunteers. In January 1836 he joined William B. Travis as co-commanders of The Alamo. There they were joined by others including Davy Crockett, who arrived in February 1836. On February 23, 1836 Santa Anna arrived with an army of up to 6,000 soldiers. About 189 Texans held off the Mexican army for 13 days. 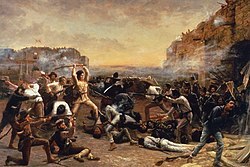 The Alamo finally fell on March 6, 1836 with nearly all the defenders killed. One of the few survivors was Sarah the wife of captain Almaron Dickinson. The knife Bowie was famous for may actually have been designed by his brother, Rezin P. Bowie. [a] Rezin (pronounced "reason") gave his younger brother (Jim) the knife so he would always have a backup weapon. It became history after the sandbar fight on the banks of the Mississippi River in September 1827. According to his brother John, Jim Bowie was a large man, about 6 feet (1.8 m) tall and about 180 pounds (82 kg). [b] He had light colored hair, grey eyes and a fair complexion. He has been described as being mild mannered. But if insulted, he had a terrible temper that quickly came out. The Iron Mistress (1952) starred Alan Ladd as Jim Bowie, the main character. It was based on the novel of the same name by Paul I. Wellman. The Last Command (1955 movie) by Republic Pictures features (Sterling Hayden) as Jim Bowie. Bowie is the main character during the battle of the Alamo and the Texas War of Independence. The Alamo (1960) by United Artists starred John Wayne as Davy Crockett and Richard Widmark as Jim Bowie. The Alamo (2004) starred Jason Patric as Bowie. 1956 to 1958, Bowie was the subject of a CBS television series, The Adventures of Jim Bowie. It was set in 1830s Louisiana, although later episodes ventured into the Mexican province of Texas. The show, which starred Scott Forbes as Jim Bowie, was based on the 1946 novel Tempered Blade. 1995, Kenneth Tobey portrayed Bowie in the final installment of a Walt Disney miniseries titled Davy Crockett at the Alamo, which aired on ABC Television on February 23, 1955. Bowie also is the namesake of rock star David Bowie. He was born David Robert Hayward-Jones. Jones changed his name in the 1960s because he feared his name was too similar to Davy Jones, a member of the already famous The Monkees. He chose the surname Bowie because he admired James Bowie and the Bowie knife, although his pronunciation uses the "bo-e" variant. ↑ The knife was not the clip point design commonly thought to be the Bowie knife today. It was a large butcher knife. Any large knife carried by frontiersmen of the time was called a Bowie knife. In a later fight, Bowie's hand was badly cut when it slipped down the handle onto the blade. So it had no hand-guard as modern versions do. ↑ The average height of American men in 1800 was 5 feet 8 inches (1.73 m). ↑ "Jim Bowie Biography". Bio/A&E Television Networks, LLC. Retrieved 22 January 2016. ↑ 2.0 2.1 2.2 2.3 2.4 William R. Williamson. "James Bowie 1796-1836". Texas A & M University. Retrieved 22 January 2016. ↑ 3.0 3.1 3.2 3.3 3.4 3.5 "Bowie, James (1796–1836)". Texas State Historical Association. Retrieved 23 January 2016. ↑ "James Bowie". PBS.org. Retrieved 22 January 2016. ↑ 5.0 5.1 5.2 "Jim Bowie (1796-1836)". The Encyclopedia of Arkansas. Retrieved 22 January 2016. ↑ 6.0 6.1 6.2 6.3 6.4 6.5 "A Guide to the James Bowie Papers, 1831-1904". Briscoe Center for American History, University of Texas at Austin. Retrieved 22 January 2016. ↑ 7.0 7.1 "Bowie Knife Fights, Fighters and Fighting Techniques". Bowieknifefightsfighters. 9 February 2007. Retrieved 23 January 2016. ↑ 8.0 8.1 8.2 "Santa Anna and the Texas Revolution". Andrews University. Retrieved 22 January 2016. ↑ 9.0 9.1 9.2 9.3 9.4 "Battle Of The Alamo". History Net. Retrieved 22 January 2016. ↑ 10.0 10.1 10.2 10.3 "Origin of the Bowie Knife". The Texas Reader/Copano Bay Press. Retrieved 22 January 2016. ↑ "Bowie Knife". Texas State Historical Association. Retrieved 22 January 2016. ↑ 12.0 12.1 John Bryant. "A Knife Like Bowie's". Texas A & M University. Retrieved 22 January 2016. ↑ 15.0 15.1 Bosley Crowther (20 November 1952). "The Iron Mistress (1952) THE SCREEN IN REVIEW; Jim Bowie and His Knife Are Resurrected at Paramount in 'The Iron Mistress'". The New York Times. Retrieved 23 January 2016. Wikimedia Commons has media related to Jim Bowie. What became of Jim Bowie's famous knife? This page was last changed on 19 March 2019, at 14:43.